London broil is not actually a cut of meat, but a cooking method, in which the meat – often marinated – is pan-broiled quickly in the oven under high heat and sliced thin against the grain. However, its affiliation with the English capital extends only as far as the name. Properly prepared, this juicy, tender beef dish can be a real crowd pleaser. Though flank steak is the traditional meat used in the dish, these days other lean, tough, moderately priced cuts like round or shoulder are sold as "London broil." These cuts can be referred to interchangeably as London broil and alternately prepared in a slow cooker. Doing so, it should be noted, abandons the cook style that gives the dish its name because historically the "broil" refers to the oven method of cooking it quickly at a high temperature. 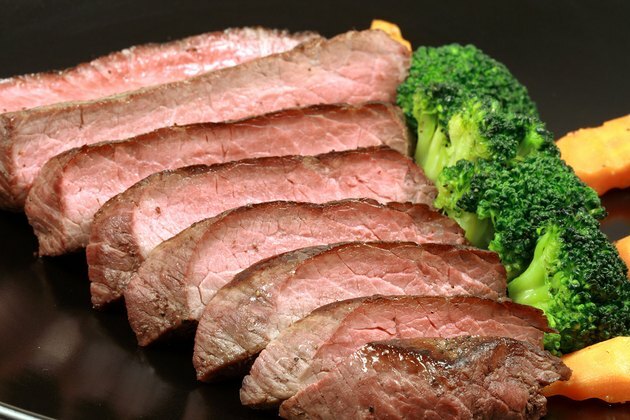 The reason that the kind of tough cut used for a London broil also works well in slow cooker is because the long cooking times and ability to braise in liquid can make the meat more tender. 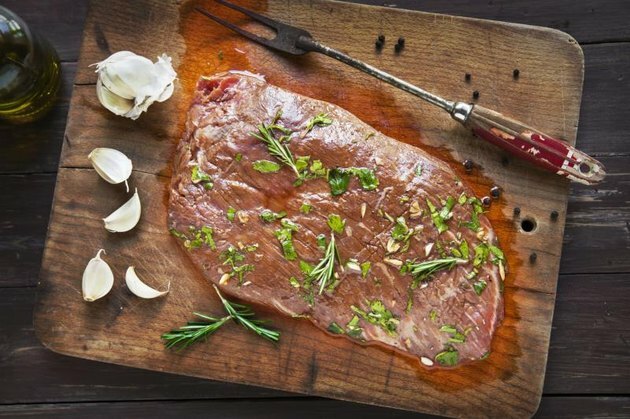 "The abdomen is tough and the beefiest in flavor," says Marissa Guggiana of the flank steak in her book "Primal Cuts: Cooking with America's Best Butchers." "You must either cook this dish very quickly or very slowly if you don't want the texture to turn against you," she writes. 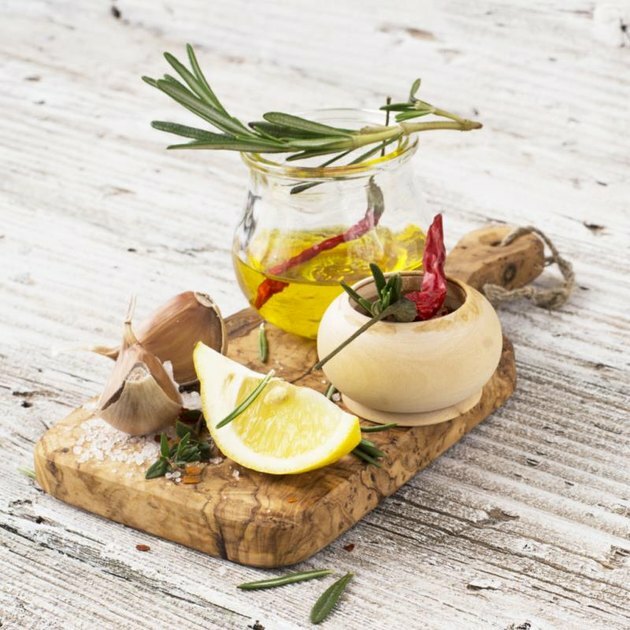 Guggiana recommends that the flank – that lean flat steak from the cow's underbelly – be prepared with peppers, shallots and other aromatic vegetables. 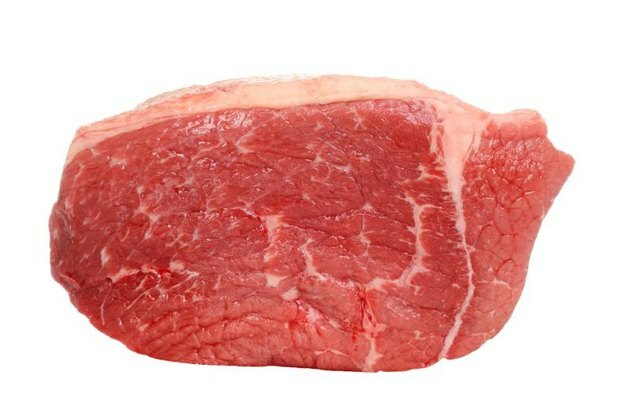 A round steak is from the rear leg of the cow, and includes the tough eye of round cut, the flavorful top round, the bottom round and round tip steaks. "The eye of round is also ideal for an elegant braise; put it in the slow cooker when you leave for work," she instructs. A flank steak used in a traditional London broil dish is often marinated, but cooking a "London broil" cut in the slow cooker with vegetables generally calls for broth anyway. Does that mean you shouldn't marinate? Not necessarily. Marinating the meat before slow cooking it can infuse it with unique flavors. Then put the meat in a bag and add the marinade. Marinate the meat overnight in the refrigerator then place it in the slow cooker in the morning with beef broth. Add the chopped vegetables that complement the flavor profile you've chosen (peppers and onions for a Mexican dish, for instance, or lemongrass, mushrooms, celery and carrots for an Asian dish). Discard the marinade. Place the London broil meat in the slow cooker. Add the potatoes, garlic, onion, carrots, zucchini and yellow squash to the cooker. Pour the beef broth over the meat and veggies, and sprinkle with salt and pepper. Cover the slow cooker and set the temperature for low. Cook the dish for 8 hours and by the time it's done, you'll have a mouthwatering steak dinner. Bon Appetit: "The Secret to a Tender (Not Tough) London Broil"
New York Times: "Grilled London Broil: Try It Spice and Smokey"